When WordPress 3.6 rolls out, it will include HTML5 markup code in the core. 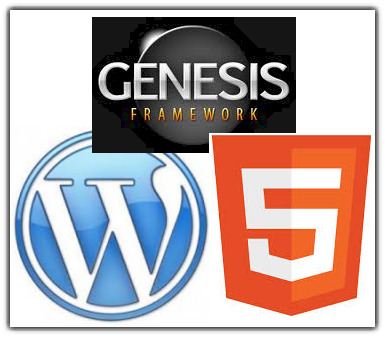 Right behind that release will be the Genesis 2.0 premium framework to take advantage of the new features. Since it’s not likely that you own a theme that can make use of HTML5, and since all browsers don’t support it yet, you may be wondering why you’d want to go to the trouble of updating your theme. In a word, microdata, that’s why. Microdata talks to other machines, like search engines, and tells them more about the content being indexed. It gives the content a structure. In other words, microdata is candy for Google and your content will be surrounded by it. When you help Google, it helps you. See how adoption of HTML5 will give your site an SEO leg up in your niche and put you ahead of your competition and seen in SERPs. HTML is an acronym for Hyper Text Markup Language. It was created in 1990 as a way to standardize the code for displaying content on the Internet. That code is interpreted by browsers and read by search engines. Every browser does it a little differently. One of the reasons for that is because not every developer writes well-formatted code. Some browsers interpret the code literally, while most give a little wiggle room. HTML has evolved over the years. Version 4, which was standardized in 1997, and significantly revised in 2000 to version 4.0.1, is still the dominant version in use today with a few sprinklings of HTML5 thrown in. The first working draft of HTML5 has been in existence since 2008. In December 2012, HTML5 was designated as a Candidate Recommendation, meaning that it is far enough along to consider for widespread use. A fully stable release is not expected until 2014. Why Push for HTML5 Now? In 2010, Steve Jobs made his own personal appeal for adaptation of HTML5. As most of you know, he refused to include Flash support on any of Apple’s iDevices in favor of promoting the universal markup of HTML5. It didn’t work. Flash is still the default markup for videos, instead of the .mp4 standard of HTML5. Enter Google. The microdata markup, or code tags, in HTML5 give search engines a clear-cut message about what type of data, or content, is being indexing. Google likes that very much – and wants more of it. Those tags go way beyond videos. I won’t get too technical here, but there is lingo that goes with all of this, and you’re going to be hearing more about it soon. So, I want to familiarize you with it just a bit. Microdata provides vocabularies, and those provide semantics. So, vocabularies are a way of talking about things, and semantics are the meanings of those things. On a rare occasion in 2011, Google, Bing, and Yahoo collaborated on a thing called Schema.org to help define a common set of microdata semantics that they could all index. Out of that came ways to identify data for things like a: Person, Event, Organization, Product, Review, or Breadcrumb. Then came Google Rich Snippets that have become a huge draw of late, especially for authorship. WordPress dominates the Internet as a CMS (Content Management System), boasting many big and famous sites running on it. The developers have used that clout to do some things that just need to be done, like cut off support for any version of Internet Explorer below version 8, and PHP below version 5 (that’s a coding language in WordPress). Parts of HTML5 have already been in use for years. WordPress is pushing its weight around again and trying to bring even more of the cool features of HTML5 into version 3.6. One of the ways they hoped to get more users excited about it was by prominently featuring Custom Post Types. But, it proved to be too much of a project to include in the core and will only be offered as a plugin. But, they are leaving in some HTML5 tags, namely those for easily embedding audio and video. As mentioned, Google gobbles up semantic markup. If you’ve tried to do any SEO on your site at all, you’re already more familiar with it than you realize. When you create a title for your blog post, HTML tags are placed around it to tell search engines what it is. Specifically, it places both a < title > tag and an < h1 > tag around it. This tells Google what it is and that it’s extremely important. HTML5 tags have a slightly different format for some of that markup, and lots of extra ones too. I mentioned that Post Formats would not be included in the core of WordPress 3.6. But, Custom Post Types, introduced in WordPress 3.0 are still going strong. Custom Post Types are already in use on specialty niche sites like those used for recipes and real estate, and in some plugins for things like events. It’s what gives those sites the customized formatting of the content and extra descriptions of certain elements, commonly called metadata. HTML5 is going to make all of that easier for search engines to index. That’s good for SEO. I’m a huge fan of the Genesis framework and StudioPress themes. They are chomping at the bit for WordPress 3.6 to come out because they already have a couple of themes in their stable that can run with it the minute the gate is opened, namely a real estate theme and a recipe theme. It is their goal to help folks in those niches get an SEO edge by making full use of the schema markup in HTML5. And you can bet that other themes are on the way. Don’t worry. All current themes that don’t have HTML5 support in them will still work just fine. And, there are ways to update those themes to take support HTML by simply updating the CSS file, or style sheet. (I’ll have more on that in an upcoming post). Don’t worry. Your current StudioPress theme will run just fine after the Genesis 2.0 update. Here’s Brian Gardner’s statement on that. And, if you’re itching to update your theme to take advantage of HTML5, you can. You’ll find his suggestions in that post as well. HTML5 is coming, thank goodness. And more site owners are going to finally have the opportunity to take advantage of all it offers. That will push more browser support for it as well. So, it’s a process, and it pays to be patient (and to invite anyone you know still using Internet Explorer into the 21st century by switching to something better). Want to try a Genesis theme? You can, and all without disturbing your current site. So Clear. I wait with baited breath for more. This probably means I finally need to update my very old theme. Hmmm, guess I will start looking. Yes, you have the kind of content that will be able to make use of these features, Shelly. And, you may want to combine them with Custom Post Types. While they won’t be included in the core, they will be available as a plugin when WP 3.6 comes out. Seems like we’ve been waiting for WP3.6 and Genesis 2 for ages and then WP3.5.2 suddenly appears! That was a total surprise. I think lots of people are waiting to get to grips with the HTML5 and the Schema.org markup. I’m hoping that it will all become a little clearer once I actually come to do it. I have put together a post on a few tools that will help with HTML5 activation and changing your stylesheet to reflect the new markup. I won’t leave a link without your permission, but if you would like the link please let me know. Keith, please do leave us your link if you’re comfortable with this disclaimer. I would like to caution folks, especially my clients, that if they have a customized Genesis theme, it might be best to let the designer handle this transition rather than doing it yourself, even with the help of DIY code tools. No problem with your disclaimer / caution note – makes perfect sense. Post contains a video and links to information that Brian Gardner at Studiopress has put together. I printed off your “Feedburner RSS to Mailchimp” guide earlier so I will be reading that tonight. Great roundup, MaAnna. I made the HTML5 push on my website a few days ago after Genesis 2.0 came out. It’s something we should all consider in the coming months. It would be interesting if I get an organic traffic bump now but I doubt it. But HTML5, Schema and microdata are things we’ll be hearing more of soon. Rob, thank you for your kind words. I hope you will post more about your experience with adding the markup to your site and any results you see in search, if you can separate that out as the cause. I follow your RSS feed, so will be looking to see how it goes for you.